Lake Forest is more of a lodge than a cabin. It has been built in the "post and beam" architecture of the Pacific Northwest, with wood and beams coming from Washington State and British Columbia. It sits on over 12 wooded acres, on a five acre private lake (only shared by the sister cabin named Serendipity Park), adjacent to state forest and a large land conservation area protected from development. The entrance drive is private and beautiful. It's as though you are driving through Brown County State Park. The entrance is enhanced by a short, easy ramp as well as steps, so that a wheelchair or mobility cart can easily access the lodge. The Master and an additional bedroom are on the main level, and two additional bedrooms are on the lower, walk-out area facing the lake. All have king beds and exceptional views. The Master Bath (main level) is handicapped accessible. The doors to the Master Suite and bath are oversize 34" doors for wheelchair access. The second main level bedroom is adjacent to another full bath with tub/shower. In addition there is a powder room off the main living area. The large kitchen has solid cherry cabinets, and is open to the dining and living areas. A large island provides seating for intimate gatherings. The dining area has a solid white oak table made by the owner, seating eight. 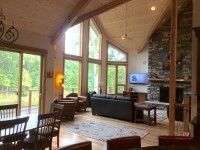 A huge stone fireplace and expansive windows dominate the main living area. Outside on the main level, a deck runs the length of the lodge, plenty of space for your entire group to dine al fresco. Off the dining area two sliding, eight foot tall oak doors on barn hardware slide open to reveal a large enclosed all-season porch with large windows and a comfy hide-a-bed. And another spectacular view. The open stairway from main level to lower level has a custom iron work railing depicting a blue heron, dragonflies, and cattails, made by a well-known Brown County artisan. On the lower level there is a large gathering room with pool table and wet bar with an under counter beverage cooler. Two additional bedrooms flank the central gathering room, as does a full bath with double vanities and a tub/shower. One of the bedrooms has a second bonus room. Step outside and into the large hot tub with seating for eight! Lake Forest contains over 3000 square feet of custom designed space suitable for larger families or up to four couples. This lodge was designed for peace and quiet and comfort. We hope you enjoy your stay! Sharing part of the same property is one of our sister cabins, Serendipity Park. 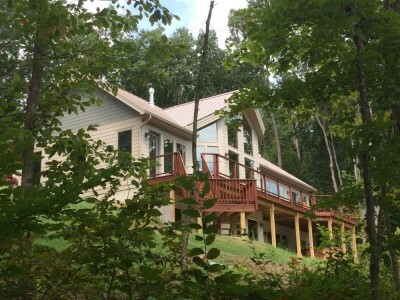 While the two cabins are both located on the same 70 acre property, neither house is visible from the other, so your privacy (except shared lake) won't be interrupted. The fact that the cabins share the same property is very handy for families or group of friends who desire two cabins being fairly close together.